After years of drawn-out lawsuits, property disputes and heartbreak, Don and Shirley Nelson are leaving Lowell Mountain. The neighbors of the 21-turbine Kingdom Community Wind project announced a settlement with Green Mountain Power this morning. GMP will pay $1.3 million for the Nelsons' 540-acre farm in Lowell, which has been in the Nelson family for 72 years. The Nelsons can remain in their home for up to two years and will retain 35 acres of property in Albany — but according to their statement, they intend to move to "a location well away from the turbines." The couple claims the giant windmills have brought them grief and ill health since they were constructed three years ago. 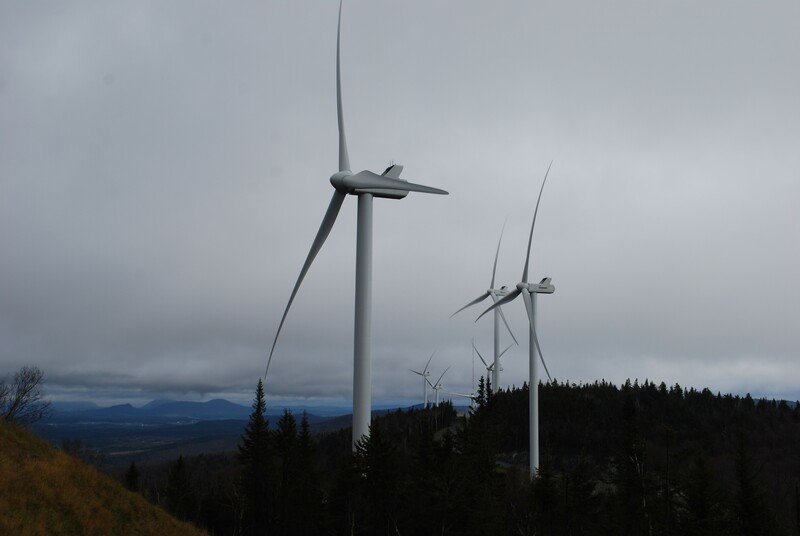 The Nelsons couldn't be reached for comment this morning but said in a press release that they felt it was clear that the turbines "were not coming down and the effect on Lowell Mountain was irreversible." When Seven Days visited Lowell Mountain in 2012, Nelson spoke over the dull rush of a turbine turning in the distance — it sounded like a fast-moving river. At the time, Nelson was collecting signatures from neighbors attesting to the noise. “Some didn’t care much at first, but, boy, are they opposed now,” Nelson said. The retired dairy farmer blinked back tears, muttering, “Goddamn it," as he tried to express what the turbines had done to his wife's health and well being. GMP spokeswoman Dorothy Schnure said in a statement that the settlement "represents an opportunity for both to move forward, and we are pleased to have reached agreement." She also said that Kingdom Community Wind marks an important investment in renewable energy in Vermont, and that Vermonters place a high value on the energy produced at the ridgeline wind farm. Since 2012, she said, the project has generated enough electricity to power more than 24,000 homes. The settlement comes after a years-long dispute about property boundaries between the Nelsons' farm and the Kingdom Community Wind project. It made headlines in late 2011 when protestors camped out and were arrested on what the Nelsons maintained was their land. GMP's attorney drafted a temporary restraining order that forced the Nelsons to clear their property of obstructions during the blasting phase of the project. The Nelsons in turn filed a counter suit. The so-called "Lowell Six" protesters were found guilty of trespassing in Orleans County Criminal Court. Annette Smith, the director of Vermonters for a Clean Environment, said this morning that she and her organization fully supported the Nelsons in their decision, and appreciated "how difficult it was." Smith said she'd worked with the Nelsons for a long time to imagine alternative uses for their farm. They considered building a slaughterhouse, putting up a "wind turbine motel" for people curious (or dubious) about the effects of living near a turbine, or collaborating with nearby Sterling College on an educational enterprise. The Nelsons also did some planning around a possible small business incubator focused on farming, including beekeeping, haying and vegetable and beef production. "It is a spectacular property — or was — for agriculture," said Smith. "We investigated all kinds of possibilities and ultimately came to the realization that it really has no value and no use," said Smith. "Green Mountain Power took the value of the property. Under those circumstances, this was the only possible outcome." Smith said the Nelsons first decided to retire and sell their property 12 years ago, but failed to find a buyer after the wind turbines were proposed for the ridge that looms above their hill farm. Once the turbines went up, Smith said, the Nelsons suffered health effects ranging from racing heartbeats to ringing in the ears and headaches. "I’m not going to say it’s a fair settlement, because of the pain and suffering the Nelsons went through … but it’s a settlement that enables them to move on with their lives," said Smith. "It is filled with heartbreak, but it was necessary." Fifteen years after Searsburg, why are Vermonters still fighting about wind power?